Thank you for your letter of July 14, regarding steam humidification systems and application of the Occupational Safety and Health Administration's (OSHA) Hazard Communication Standard (HCS), 29 CFR 1910.1200, to worker exposures to volatile amines emitted from those systems. I apologize for the delay of this response. We are also in receipt of the letters you have written on this same topic to several other OSHA regional and area offices, including the Directorate of Technical Support in 0SHA's National Office in Washington; this letter will respond to the issues raised in all such correspondence from you. Your letters take issue with my response to Mr. Walter Macht of Betz Entec, Inc., dated May 8, which stated that "employees such as office workers who may be incidentally exposed to the chemicals in trace amounts from the humidification system would not be covered under the provisions of the HCS." Your recent letters specifically request "an overall definition of the potential hazard in institutional and industrial workplaces, where the steam humidification process is far more common." Exposures to employees incidentally exposed to trace amounts of nitrosated compounds from ventilating apparatus is not a situation that is or would be covered under the information transmittal provisions of the HCS. As was pointed out in my May 8 letter, certainly all employees who work directly with these chemicals such as maintenance workers, building engineers, or other employees exposed or potentially exposed by directly handling or storing the anti-corrosive chemicals would be covered by the provisions of the rule. 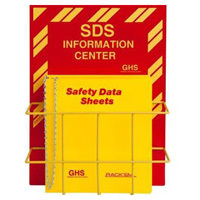 These employees' employers must make material safety data sheets (MSDSs) available to them, train them on the hazards associated with exposure, and ensure that container labels provide adequate required information, including, through use of the same identification, a link to the more detailed information on the MSDS. However, indirect exposures to other employees in the building to the trace amounts of amine compounds which may be produced in the ventilation systems is not, again, a situation that is intended to be covered under the Hazard Communication rule. Information transmittal, under the HCS, does not extend to the downstream workers who may be incidentally exposed to a material generated in a ventilation system. The statement you quote from the (now obsolete) OSHA compliance directive, CPL 2-2.38B, on hazard communication that "if a hazardous chemical is known to be present (e.g., nitrosamines are a known byproduct of the process) then it is covered by the standard." This statement, which has been deleted from the current directive, CPL 2-2.38C, dated October, 1990, (copy enclosed), was written to address the formation and coverage of byproducts in industrial processes to which employees who work directly with the chemical may be exposed during the process. For these directly exposed workers, material safety data sheets for steam humidification compounds should include information on the formation of these n-nitrosamine compounds if, under their normal conditions of use in the workplace, employees (again, the maintenance workers, engineers, building personnel, etc., who work directly with the compounds) may be exposed to the byproducts formed. Transmittal of hazard communication information, i.e., labels, MSDSs, and training, does not extend to other employees in the building who may or may not be subsequently and incidentally "exposed" to the trace amounts which may be emitted from the building ventilation system. OSHA also does not have specific Permissible Exposure Limits (PELs) for the N-Nitroso compounds mentioned in the memo you reference, Mr. Thomas J. Shepich's (Director, OSHA Directorate of Technical Support) memorandum of March 15, 1990, to OSHA Regional Administrators. This memo specifically was issued to alert OSHA field personnel to the potential for amine compounds to become nitrosated during certain industrial processes that our health compliance officers investigate. OSHA has no regulations which specifically prohibit exposure to compounds which may be generated in steam humidification systems. While the presence of these compounds may contribute to indoor air pollution, the Agency can enforce no specific exposure limits which would limit and control workplace exposure levels. I hope this discussion and enclosed reference material will be helpful to you in understanding OSHA's policies with regard to the HCS and the steam humidification processes you described.